IBM's Watson supercomputer may be boning up on its medical bona fides, but the concept of Dr. Watson is nothing new. We've been waiting on our super-smart computer doctors of tomorrow for over 30 years. 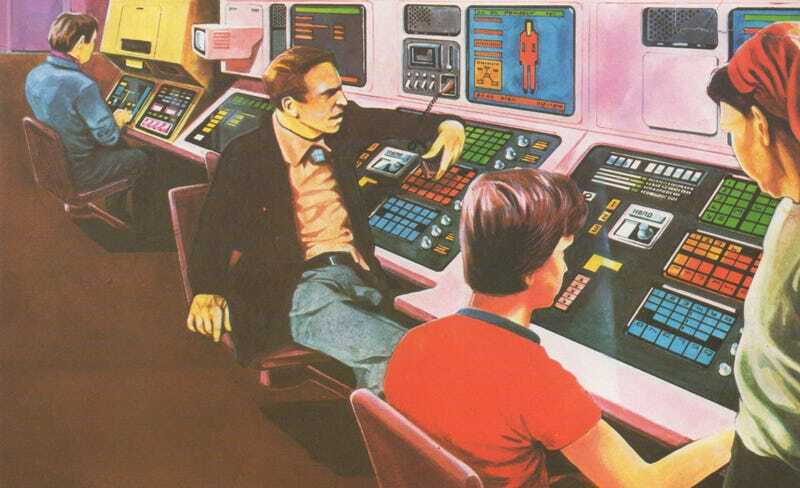 The 1982 book World of Tomorrow: Health and Medicine by Neil Ardley showed kids of the 1980s what the doctor's office of the future was going to look like. The room is filled with automatic diagnosis stations, prescription vending machines, and plenty of control panels sporting colorful buttons. The only thing that's missing is, well, a doctor. A yearly physical wasn't going to be some humdrum affair; it'd be as cool as playing a computer game! Or, so we were told. A visit to the doctor in the future is likely to resemble a computer game, for computers will be greatly involved in medical care. Now doctors have to question and examine their patients to find out what is wrong with them. They compare the patients' answers and the examination results with their own knowledge of medical conditions and illnesses. This enables doctors to decide on the causes of the patients' problems. Computers can store huge amounts of medical information. Doctors are therefore likely to use computers to help them find the causes of illnesses. The computer could take over completely, allowing doctors to concentrate on patients who need personal care. The computer won't just be a dumb machine that's fed info. The robo-doctor of tomorrow will be able to ask questions of the patient, narrowing down all the possible things that could be wrong. The computer will question the patient about an illness just as the doctor does now. It will either display words on a screen or speak to the patient, who will reply or operate a keyboard to answer. The questions will continue until the computer has either narrowed down the possible causes of the illness to one or needs more information that the patient cannot give by answering. The patient will then go to a machine that checks his or her physical condition. It will measure such factors as pulse, temperature and blood pressure and maybe look into the interior of the patient's body. The results will go to the computer. This may still not provide the computer with enough information about the patient, and it may need to take samples — for example, of blood or hair. It will do this painlessly. The computer doctor of the future will also dispense the medication via vending machine, (a feature that's oddly more common for "herbal" remedies here in 21st century). Finally, the computer will dispense drugs and prescribe treatment, but a doctor will be present to discuss its results if the patient wishes. Aside from being a glimpse at the future that in some ways isn't so far off, it introduces the intriguing possibility that Obamacare's merciless death panels be staffed by the robot army it deserves.